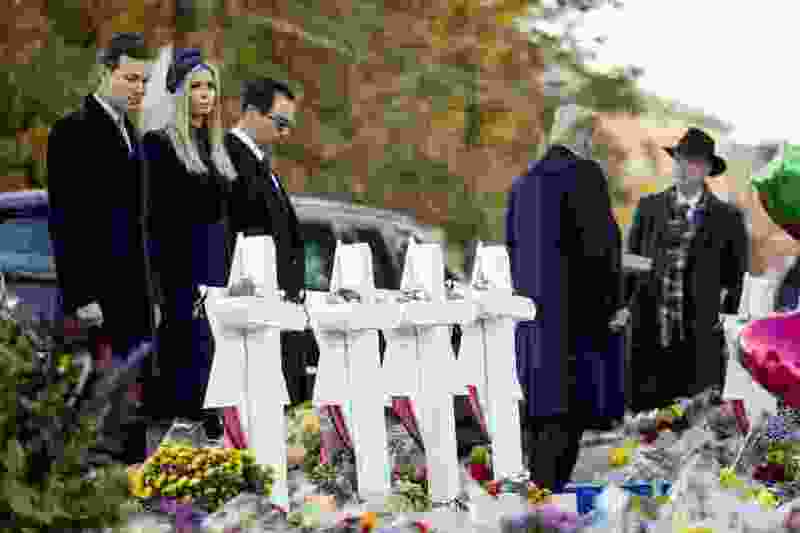 (Andrew Harnik | The Associated Press) From left, President Donald Trump's White House senior adviser Jared Kushner, Ivanka Trump, the daughter of President Donald Trump, Treasury Secretary Steven Mnuchin, President Donald Trump, and Tree of Life Rabbi Jeffrey Myers, right, visits a memorial for those killed at the Pittsburgh's Tree of Life Synagogue in Pittsburgh, Tuesday, Oct. 30, 2018. Or will people do as the president apparently desires and start “packing heat” when they attend church services? Or have they already been doing so for some time now? Will arming pastors become as popular as arming teachers? Guns don’t kill people, but people with guns too often do kill people. According to the Gun Violence Archive, thus far in 2018 in America there have been 47,225 incidents of gun violence, resulting in 11,984 deaths and 23,350 injuries. Among all nations, in 2016 the U.S., with 37,200, ranked second in gun-violence-related deaths. Brazil, with 43,200 deaths, ranked first. In the face of an obvious public danger, the policy of having no policy (or a minimal policy) is itself a policy — and frequently the worst of all.